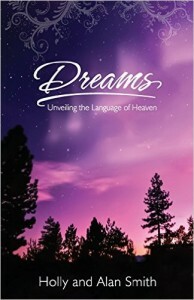 Alan and I have written a dream book called “Dreams Unveiling the Language of Heaven”. It is a succinct account of our dream interpretation technique, which came from over thirty years of trial and error, and biblical study. We want to help people have much greater confidence in their ability to decipher dreams and hear God’s voice through them. Alan discovered a way to interview the dreamer which reduces speculation about interpreting solely by symbols. This process parallels and applies to the current events of the dreamer’s lives. We have included commonly recurring dream themes and symbols, the dreams of scripture and a number of dreams from us, their interpretation and the circumstances which illumined their meanings.